Madeira taxes stoked tensions, then paid for the war. Life in an 18th-century war camp vacillated between extreme emotional duress and mind-numbing boredom. To help cope with this volatile existence, he and his officers required booze. To this end, Washington ordered a dizzying volume of what had long ago become colonial-America’s favorite adult beverage: madeira, a fortified wine produced on a small Portuguese island located 360 miles west of Morocco. On August 8, 1775, two months after taking charge of his army, Washington procured a large cask of the wine, as well as empty bottles, corks, and other paraphernalia. Over the next six months, he purchased hundreds of additional bottles and, eventually, an entire “pipe” (a term derived from the Portuguese word for barrel, “pipa”). A pipe of madeira held enough wine to fill 700 bottles, and a cask roughly the same. Washington, then, in preparation for war, ordered at least 1,900 bottles worth of the wine to be shared among his closest aides and confidants. That he chose madeira is not surprising. Colonists had indulged in Madeiran wine since the 1640s, and, by the mid-18th century, British North America accounted for a quarter of the island’s exports. For nearly a century, exclusivity and happenstance were the prime agents in this popularity. Because colonists preferred the taste of madeira that had aged and cooked in the belly of merchant ships, it was one of the few wines to benefit from the length and unpredictability of transatlantic travel. By Washington’s era, however, America’s thirst for madeira transcended convenience. According to David Hancock, a historian at the University of Michigan and author of Oceans of Wine: Madeira and the Emergence of American Trade and Taste, Americans favored the wine because its makers pioneered production techniques in direct response to consumer feedback. South Carolinians and Virginians, for instance, preferred heavily fortified wines, which were dry and “white as water.” Philadelphians liked sweet golden varieties, and New Yorkers favored sugary red sorts, which were comparably low in alcohol content. To meet these unique demands, Madeirans blended varietals and wines from different vineyards, adding coloring or sweetening agents for northern colonies, while reducing color and tartness for Southerners. Most importantly, in the second quarter of the 18th century, they began to fortify madeira with brandy. Throughout the American Revolution, these custom formulas proved immensely popular in British North America, making the wine ubiquitous through many of its hallmark events. In 1766, John Hancock celebrated the repeal of the Stamp Act by setting two pipes of madeira out in front of his house for public consumption. Two years later, he protested newly established import taxes by intentionally underreporting the number of pipes he’d imported. In response, custom officials seized Hancock’s ship, which soon encouraged a mob to gather around the port of Boston. The group, reportedly 3,000 strong, eventually destroyed a ship owned by Joseph Harrison, the port’s chief customs collector. Months later, British officials used the incident to justify an increased troop presence in the city—a decision that ultimately led to the Boston Massacre. Hancock, of course, was not the only Revolutionary icon to conspicuously consume madeira. In 1774, John Adams reported to his wife, Abigail, that after tedious days of contentious debate, delegates to the First Continental Congress would sit for hours “drinking Madeira, Claret, and Burgundy.” One year later, Thomas Jefferson famously toasted the signing of the Declaration of Independence with madeira. And then there was Washington. As the war progressed, he used his long-standing relationships with madeira importers to maintain a steady stream into his headquarters, even after Portugal, an ally to Great Britain, closed its ports to American merchant vessels. When the war ended in 1783, America’s relationship with madeira flipped on its head. The same men who had rioted over import taxes now found their revolutionary fervor tempered by pragmatism. During the conflict, the colonies accrued substantial debt. Throughout the 1780s, the nascent states weighed several options. Averse to property and poll taxes, and intent upon leaving domestic trade unburdened, several state governments began to levy tariffs on foreign goods—particularly wine and spirits. By 1790, the federal government had also adopted this process, which taxed British and Portuguese exports at much higher rates than those produced by allied nations. This assured that rum and madeira sales accounted for a disproportionate share of state and national revenue. Unfortunately for Madeiran merchants, these taxes, combined with an increasingly competitive transatlantic market, eventually eroded their hold on America. Before the war, Spanish and French wines had suffered under suffocating regulations. But afterward, they became increasingly competitive in North America. Between 1787 and 1790, exports from these nations to the U.S. grew exponentially. By 1807, sherry and St. Lucar wines eclipsed madeira in popularity, and the Portuguese soon turned their attention toward India and other newly opened markets within the rapidly expanding British Empire. 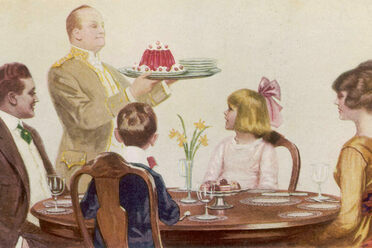 Though Americans, particularly Southerners, continued to drink madeira into the 19th century, the drink eventually transitioned into a niche dessert wine. Still, by then, it had already secured its legacy, having attached itself not only to late-colonial lore, but also to the early history of intercolonial commerce. Why Does Some Food Taste Better as Leftovers? The invasions led to an unexpected discovery.